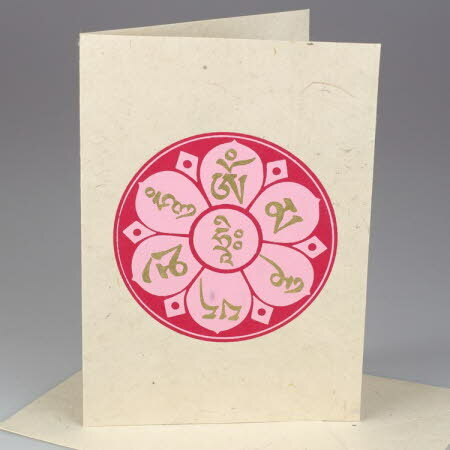 Om card handmade in Nepal with a plain natural lokta paper envelope in clear cellophane sleeve. Gold lettering on pink flower over red circle screen printed on natural handmade lokta paper card. The inside of the card is natural undyed lokta paper and is left blank for your own message. Each 6.5" by 4.5" (164 mm by 115 mm) greeting card bears a handmade design on the centre of the front cover. All of our Nepalese cards are handmade and the design may vary from the photograph. The Lokta envelopes are 6.75" by 4.75" (approximately 172 mm by 123 mm) and will comfortably hold the cards. None of our handmade envelopes is gummed, but you can use a closure method of your choice.